Mid January already and I am looking forward to February! 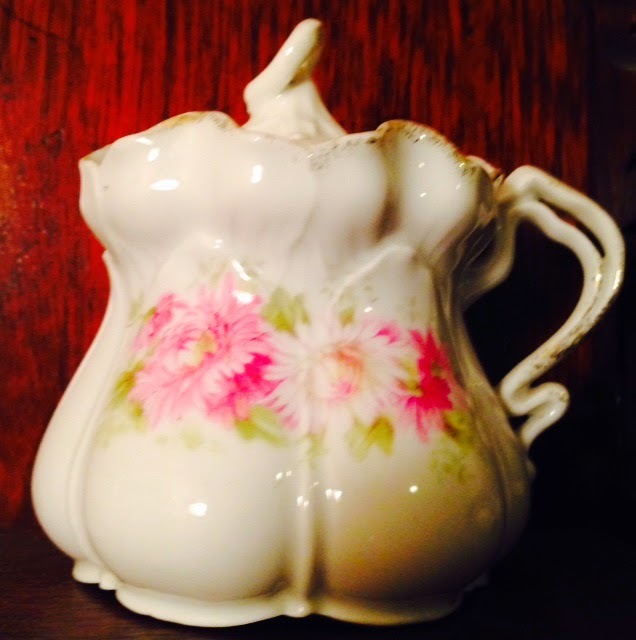 Happy Tea Time Thursday. 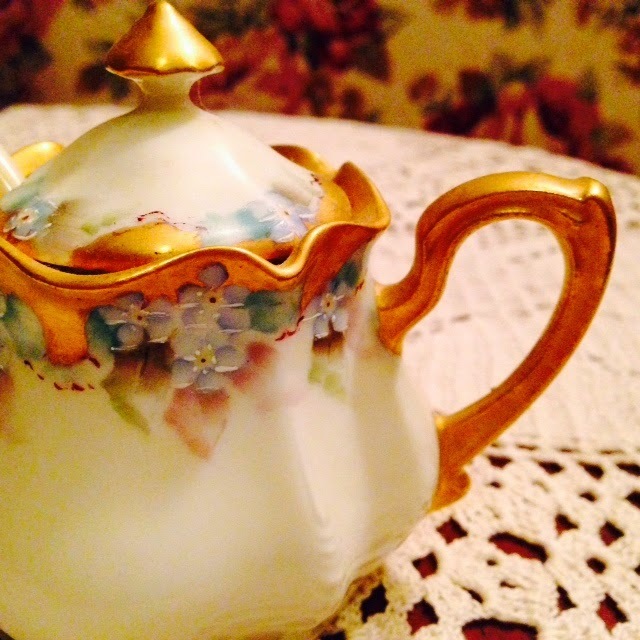 Did you enjoy a nice cup of tea this afternoon? 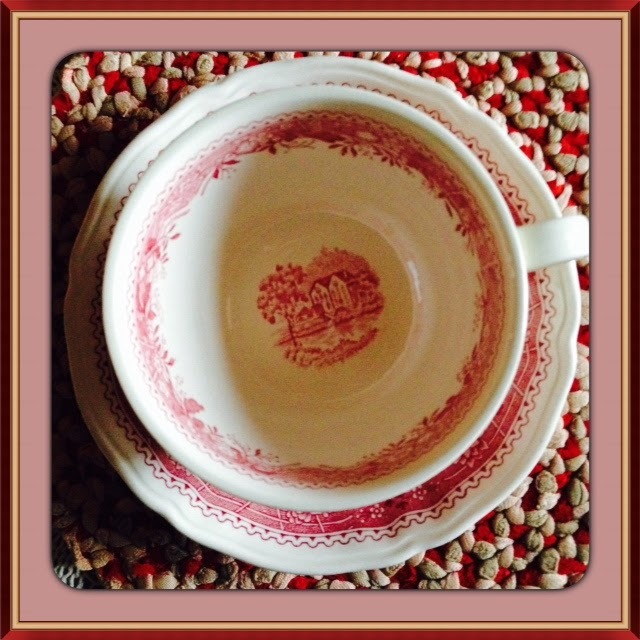 I'm sharing a red transferware teacup today that I just received. 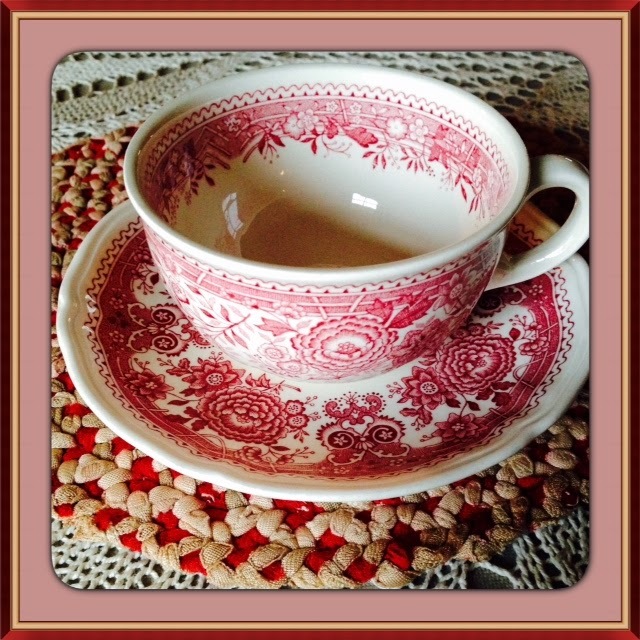 I LOVE transferware and have been on the hunt for some red teacups. I haven't had any luck finding any locally so I have had to order them online. I am waiting for three more and I hope they come before Valentine's Day. 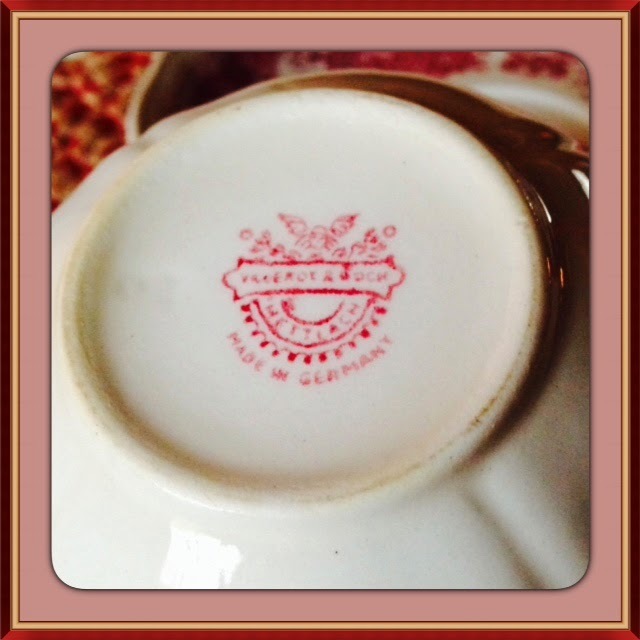 This was made in Germany and is a Villeroy and Boch Burgenland. I like the design and color. 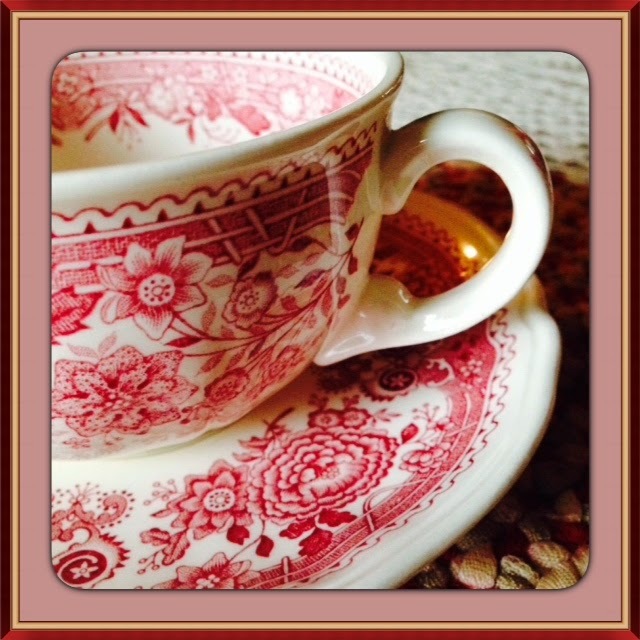 I always love to have designs on the inside of my teacups. Last fall I was at the Goodwill thrift store and I saw this hutch up on a window sill. I couldn't believe my eyes. 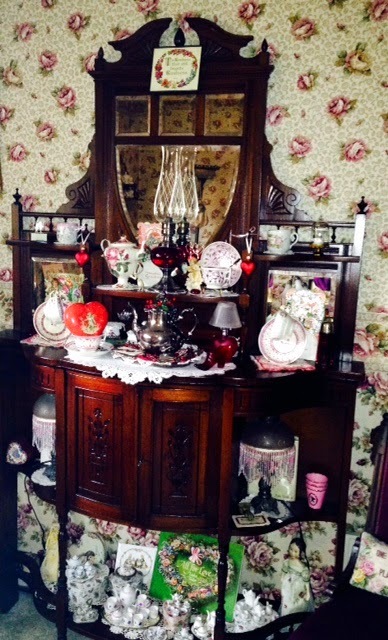 I had been looking for a corner hutch for our home for years. It couldn't be too large and had to fit into the corner and not block the heat register on one side. 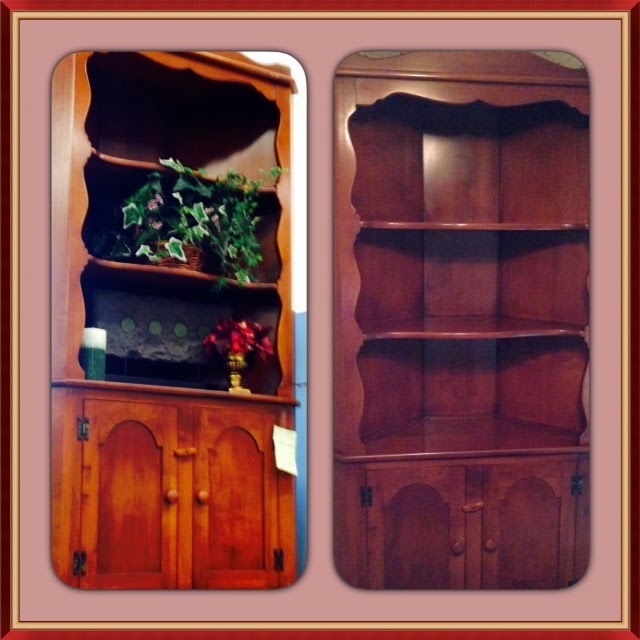 I thought this hutch looked like a good fit, but I didn't have any measurements with me. I went home and told Jimmy about it and we took some measurements with us and headed back to the store. It was a perfect fit! The price was perfect too....$69.99. The colors are true on the right hand photo. 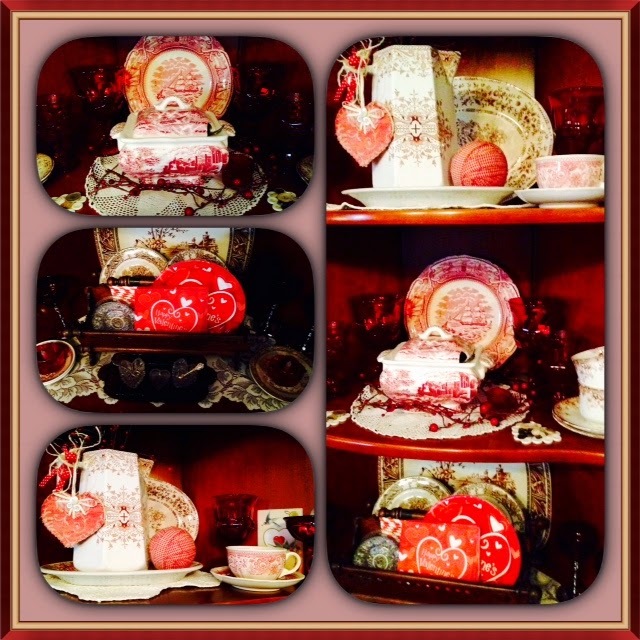 You can see how I decorated it for Valentine's Day. 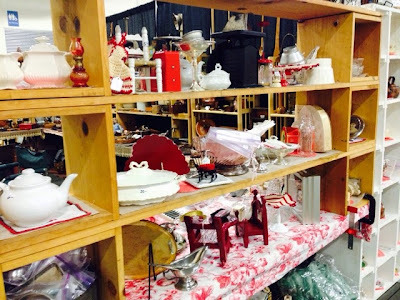 Now you can understand why I am looking for more red transferware. 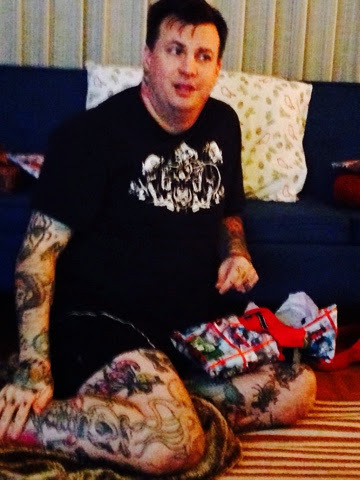 My last picture is from Christmas. 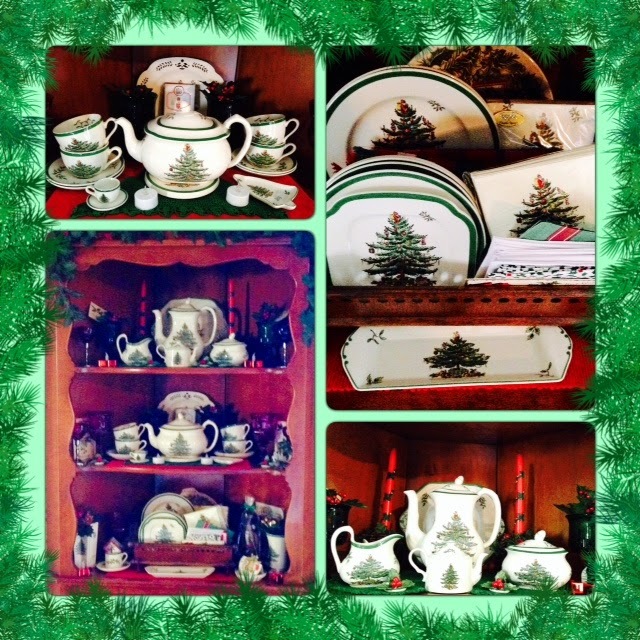 My Christmas Tree Spode looked very much at home in the hutch too. 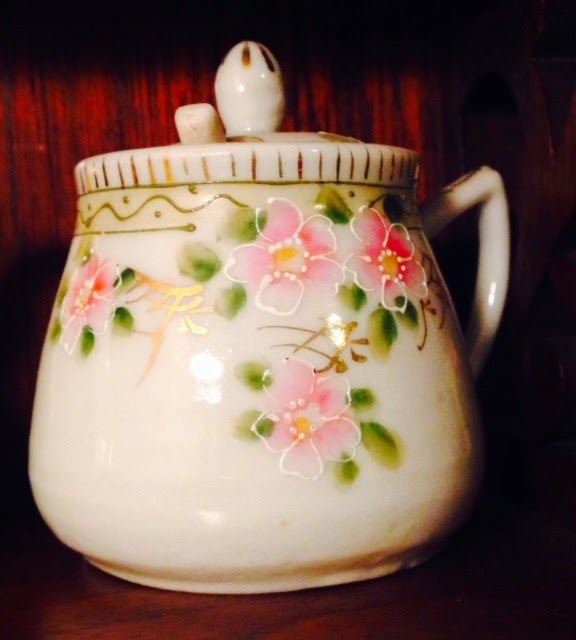 I also have my eye on a teapot....hum...should I place that order? I am so tempted! Yep, here's my Jimmy again! 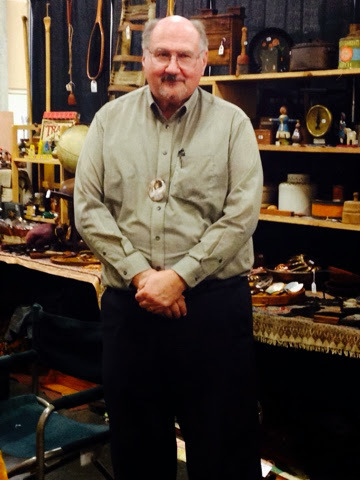 He looks pretty tired as this photo was taken after we set up his booth at the Clark County Fairgrounds in Washington last Friday. He does 3 shows in Oregon and 1 in Washington. The show in January is quite a bit smaller in size, but it actually is a very good selling show for us. He got a double booth this time and it's quite nice to have extra room for the customers to get into the booth. Friday was a bit slow, but wow....he did fantastic on Saturday and yesterday on Sunday. Even the Seahawks playoff game on Sunday didn't spoil his sales. Jim has such a gift for selling and people really love to chat with him. I love to set up the shows and that's my job. All of these pictures are from the set up. I really should have taken some photos of the booth when we take it down! He sold sooo much this time. With a pocketful of $$$ he will have to start shopping again. The next show is the first weekend in March! This is the "Tasha" section. We call it that in honor of Tasha Tudor...more primitives and wooden items. 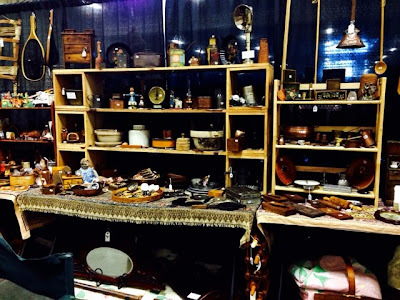 It sells well at this show and in the fall in Oregon. The "Men's" section. We have expanded it to 1 1/2 sections as it always brings the guys in. There's a lot of things to tempt women at these shows but not always a lot for the menfolk. 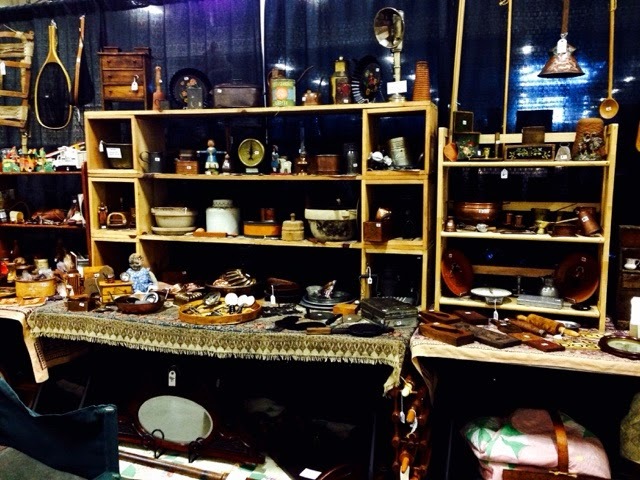 Jim does well with this section at the shows. The 3rd section is mine to play with and try different things. I can work with a theme so the booth always looks a bit different. 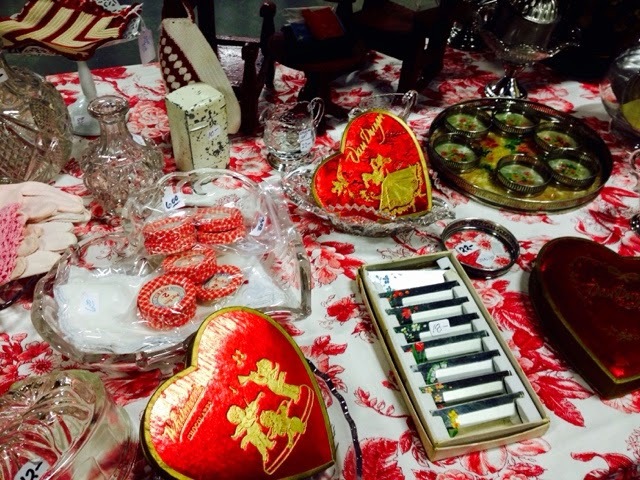 This time I went with a little Valentine look with red hearts and red items. I had fun with this table and we can offer a different type of merchandise this way. We play around with this white display at each show. 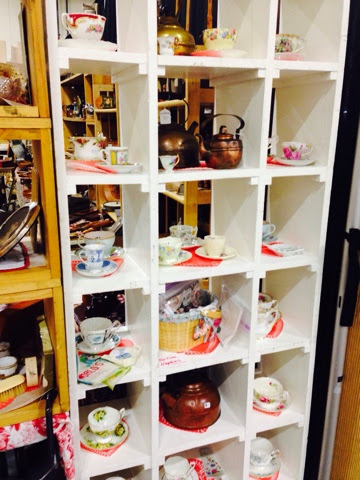 This time we filled it with tea cups, kettles and tea time napkins. It's a fun display piece. Think Downton Abbey. I am thankful for the good show. It's a lot of work, but a fun retirement "hobby" that allows us to make some extra money to go on the hunt to buy for the next show! We are two tired old dogs today! don't thing we will be doing much today. Our handyman Duane hauls all of this in and out at the shows. Without Duane, we could never do this. Thanks Duane! Ah, a typical winter afternoon here in Oregon. It's very dull and gray with rain and wind keeping those of us who don't have to venture out, inside! I had a delightful bible study this morning and I'm waiting for Otto to come over while his mommy does a few errands in Troutdale. The woodstove is going and it's very cozy in my little house. 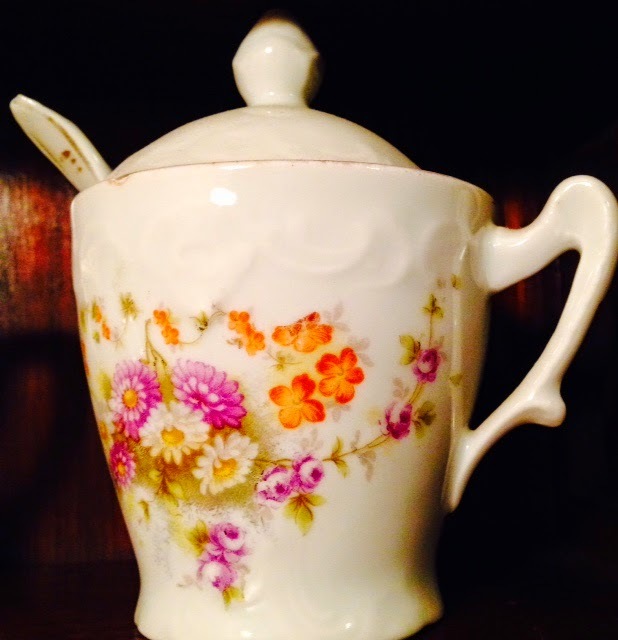 It is Thursday, so it's Tea Time Thursday. 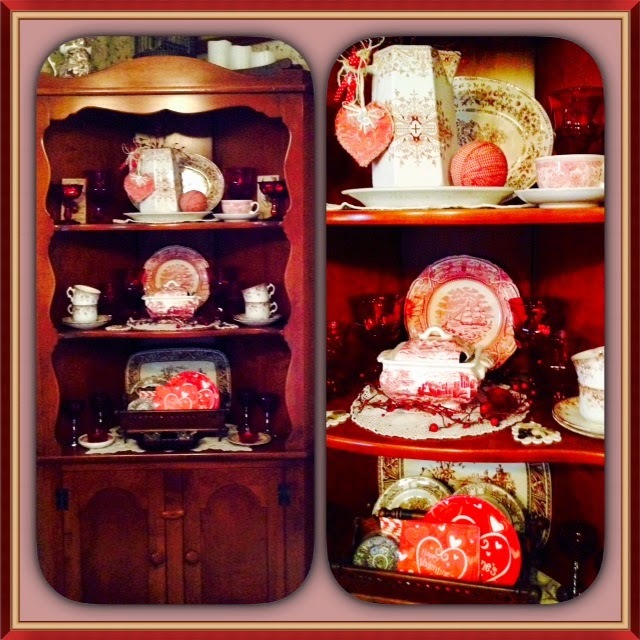 When I take down my Christmas decorations in my tea room, I just go ahead and put up the Valentine decorations. 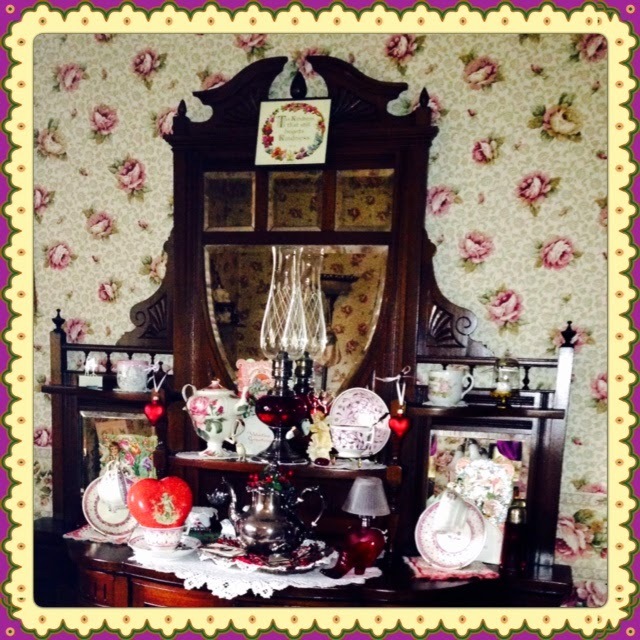 it always cheers me up and I love the Victorian goodies and the feel in my tea room. Of course, the dolls like it too and it cheers me up in the dead of winter. 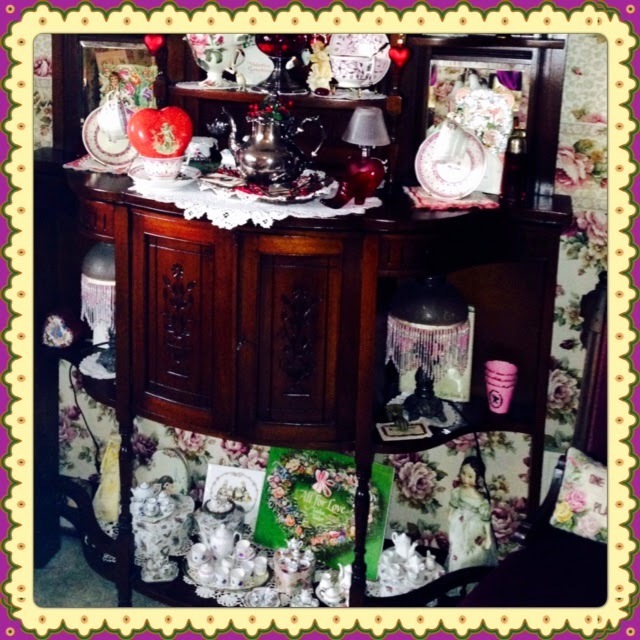 This lovely piece of furniture is called an etagere. It's kind of like a what not shelf...often with open shelves, a small cabinet area and a mirror. It was a birthday gift to me years ago from my Jimmy from a shop long gone in Troutdale called the Green Door. Oh, I loved that shop. I took a tea class there one night and sat in front of this etagere with the little tea lights burning. I couldn't get my eyes off of it. I went home and told Jimmy. He took me down to look at it a few days later and the owner told us it was sold. That was fine, I just wanted to show him. Well, a week or so later, it was delivered to my door as a birthday gift! I have so much fun decorating with it and I do love it. 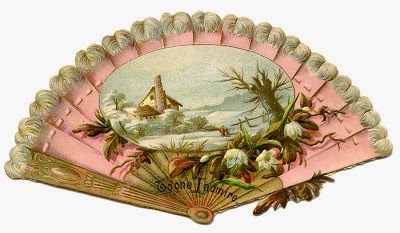 This is the top view of it with it's decorations for the Valentine season. 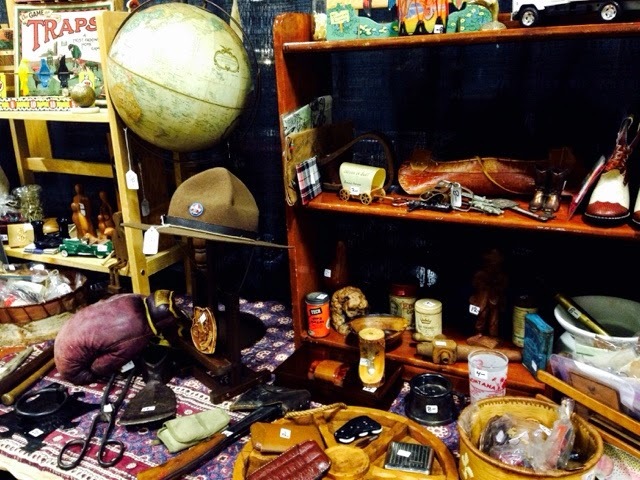 It's full of treasures and like the Victorians, I like my "stuff". You can see more of it and the bottom shelf in this photo. I decided to do something different on the bottom shelf this year. Of course, I have to start with a Tasha Tudor book. 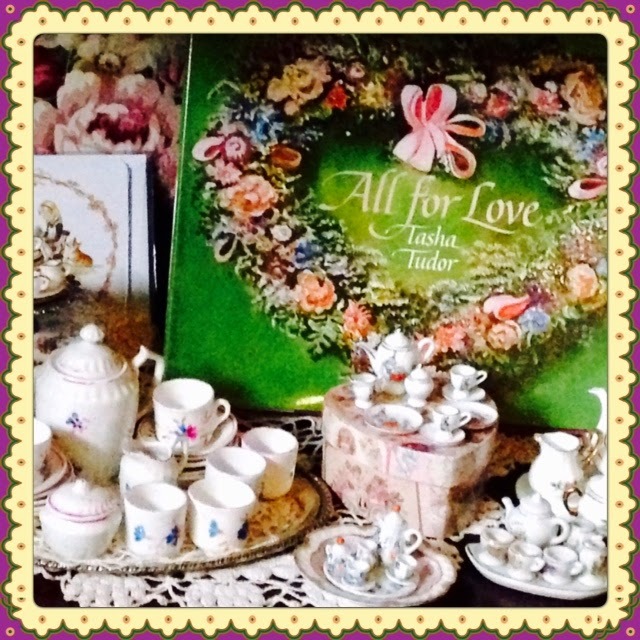 ALL FOR LOVE is a wonderful book and perfect for this time of the year. 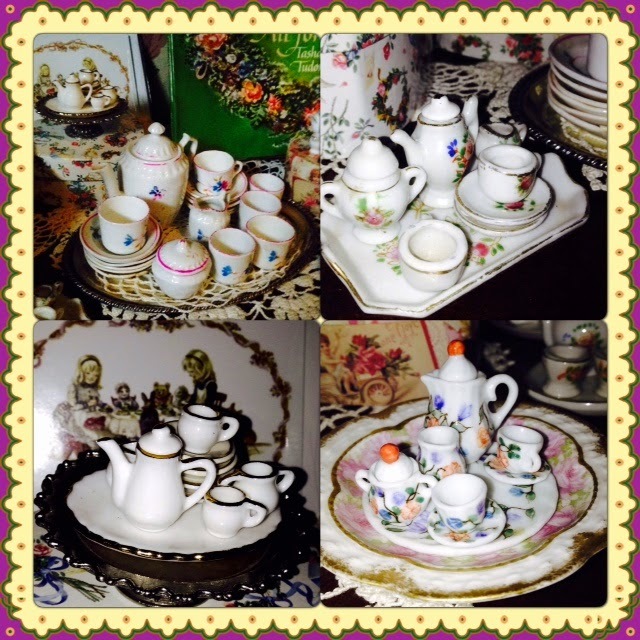 I thought it would be really fun to display an assortment of tiny doll sized tea sets. I have a passion for them! It's just an extension of my love for all tea time goodies. Some are new and some are old. Some are from my childhood and some are recent gifts and estate sale finds. One can never have enough tiny tea sets! 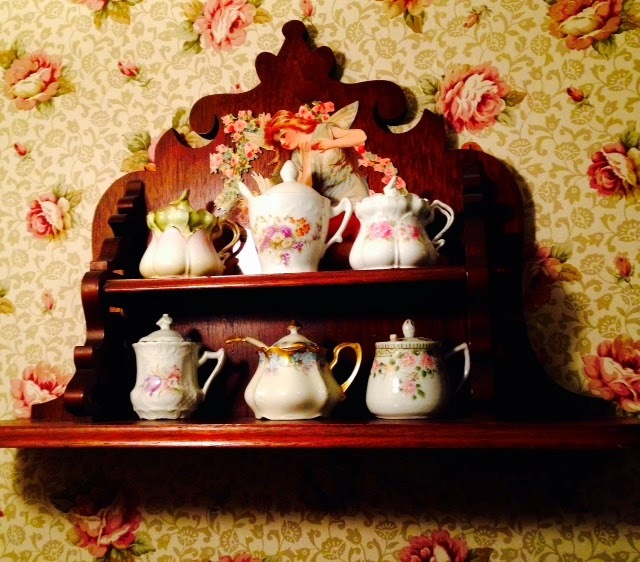 Of course I have to thank my dolls for letting me steal away their tea sets for awhile. 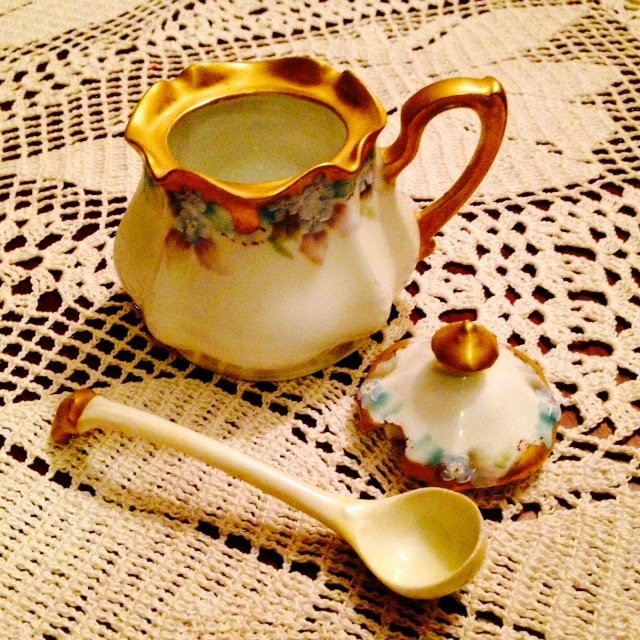 I hope you have enjoyed seeing some of my tiny tea sets today. Stay warm and toasty and have a cup of tea . Ah, Monday....a new week in bleak January. I was able to have lunch with a friend on Thursday afternoon to just sit and chat and exchange our Christmas presents. One of her most generous gifts to me was this delightful book! A Year in the Life of Downton Abbey! She knows I adore the series and this book is lovely. 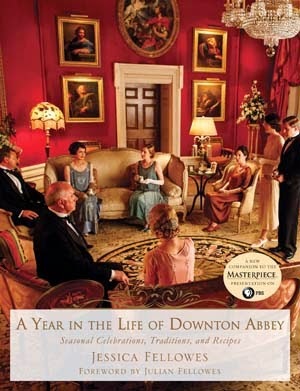 It is filled with photos and recipes as you journey though a year at Downton. I know there is a place for digital books and all, but is there anything as wonderful as a real book in your hands? I love books. Thank you so much my friend for this gift. Season 5 began last Sunday. I am hoping it will be better than season 4, which was not my favorite. As my hubby reminded me, even a bad season of Downton Abbey is something good to watch on TV. I do agree. The sets and the costumes are amazing, even if the story line isn't my favorite. Who knows what's in store for the new season? 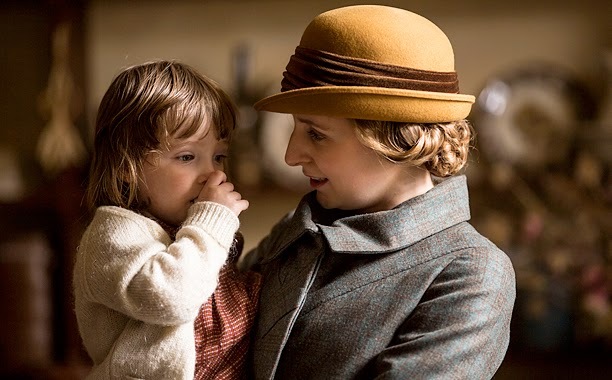 Of course we know that Edith and her little girl (still a secret from most of her family) will be an important story line. It will be another very busy week, but I am trying to work my way back into blogging. I still haven't gotten a new laptop, but I am able to get creative with posting pictures so I can still blog. 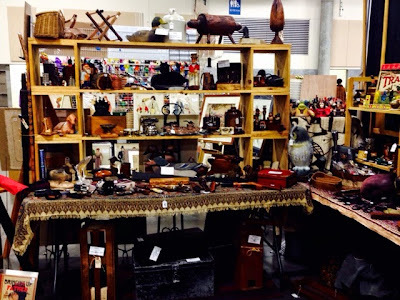 I am helping Jim get ready for our next antique show this weekend at the Clark County Fairgrounds in Washington state. It's a smaller show and a bit more fun than the others we do through out the year. I will have extra babysitting this week as he will be hauling merchandise on Thursday. We will finish pricing and packing today. So I am planning to enjoy a cup of tea this afternoon when I take a break. It has been wet and chilly here in Oregon but no chance of freezing temps, snow or ice this week. That's a good thing with the upcoming show. Have a good week. It's warm and windy today for Tea Time Thursday. The rest of the nation is blanketed in freezing cold temperatures, but we are experiencing spring like weather in the Pacific Northwest. Unfortunately, our snow pack is 58% of what it should be at this time of the year. So, as most of you are shivering, we are hoping for some more winter weather! I also want to thank all of you for your kind words and prayers for my friend's family. His service will be on Saturday. As difficult as the day will be, Jim and I will be there to honor Tim's life and support his family. 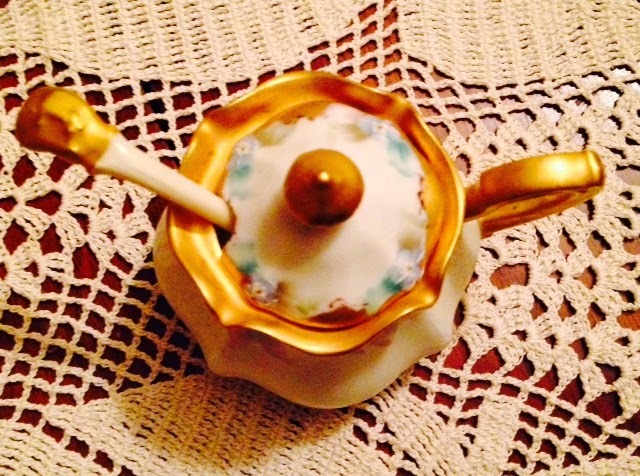 Today, I'm sharing my little collection of mustard pots. They are small little pots that were placed on the table to serve mustard. 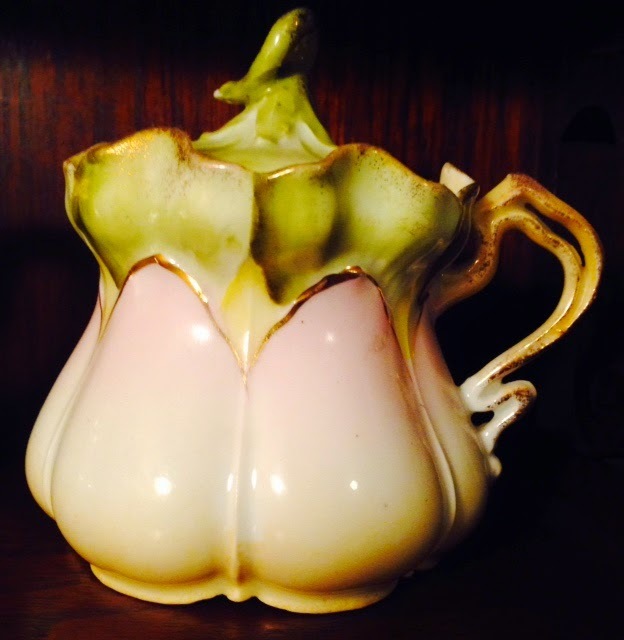 They are perfect for mustards and other goodies on your tea table too....clotted cream, marmalade or jams. Sometimes, they are called wet mustard pots, which is why they have little spoons. After mustards were "prepared", a spoon was needed to serve the mustard which was dry mustard mixed with oil and vinegar. This is my first and favorite little pot. My dear friend LaVonne sent it to me a few years back. It is beautiful and is marked Germany on the bottom. 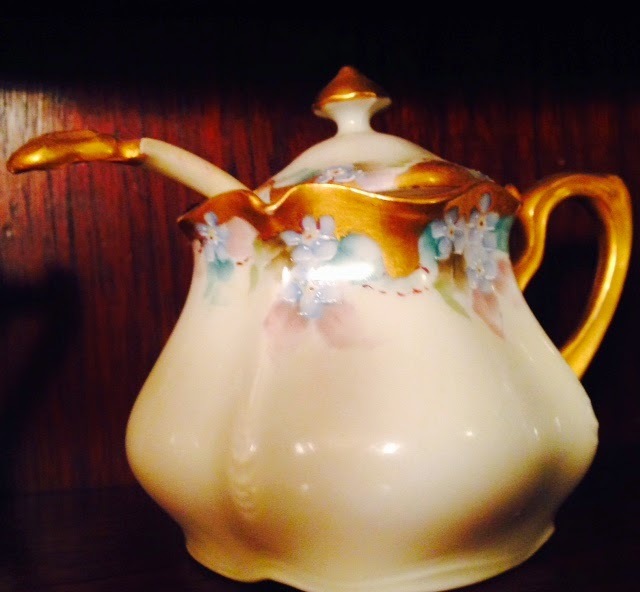 She gave it to me as it is decorated with Forget~ Me~ Nots, which has a special meaning for all of us Tasha Tudor fans. 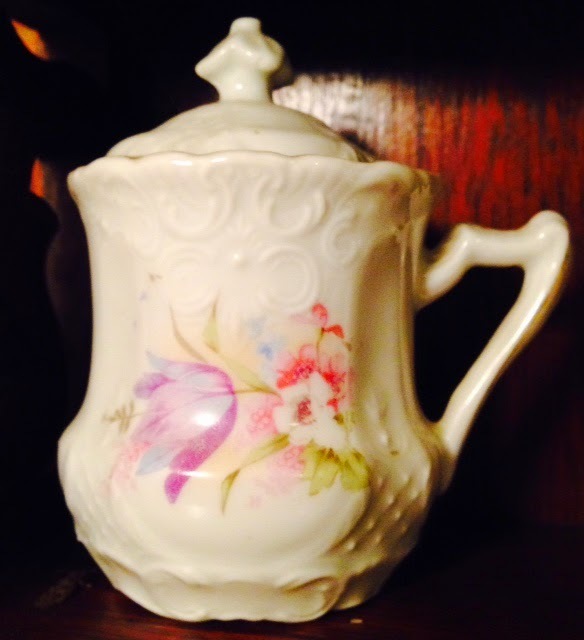 I think it is hand painted, however, it is not signed. 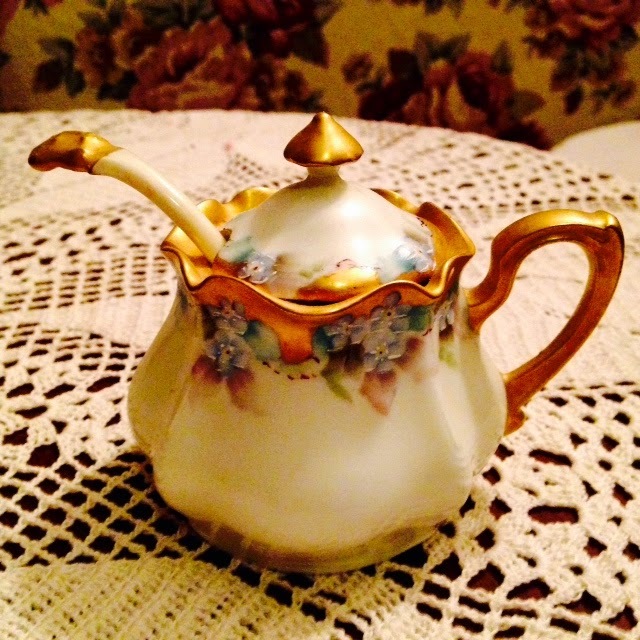 It is trimmed with gold and has a perfect little serving spoon with it . I went on the hunt for others and actually, they are reasonably priced and small. None of my other pots are marked and some have lost their spoons along the way, but I like each one. Two are the same blank but decorated differently. 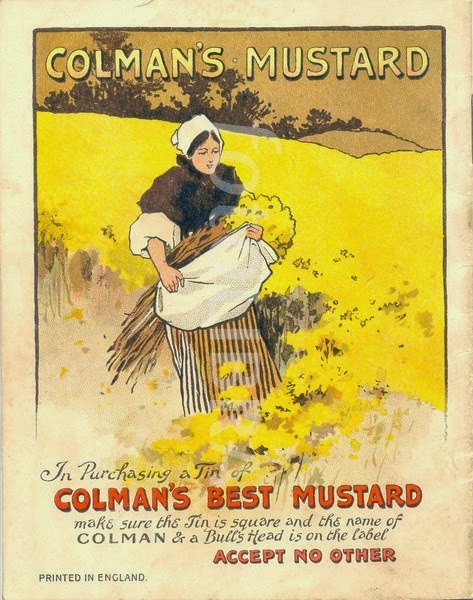 When I was looking for some information on the little pots, I found a lot of information on Colman's Mustard. Most of us probably have a box or tin in our spice cupboard. 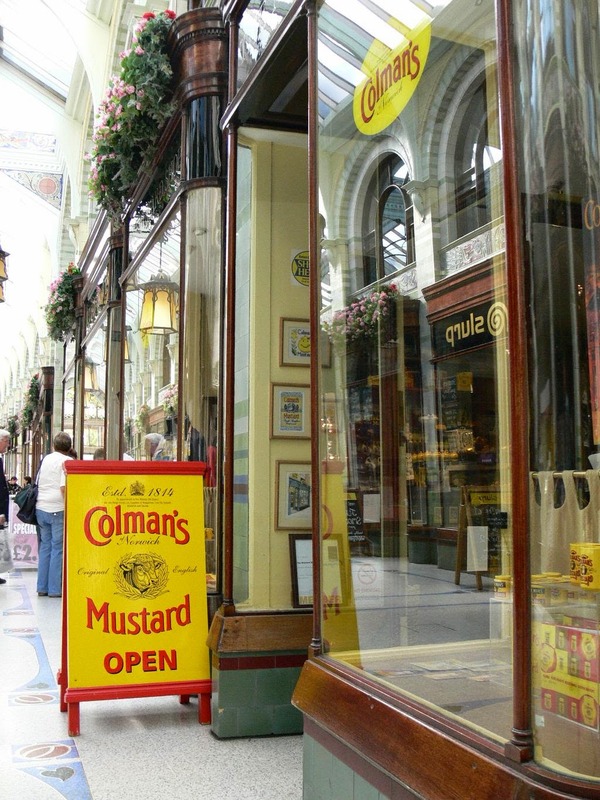 There is actually a Colman's Mustard Museum in Norwich, England. Wouldn't that be fun to visit? 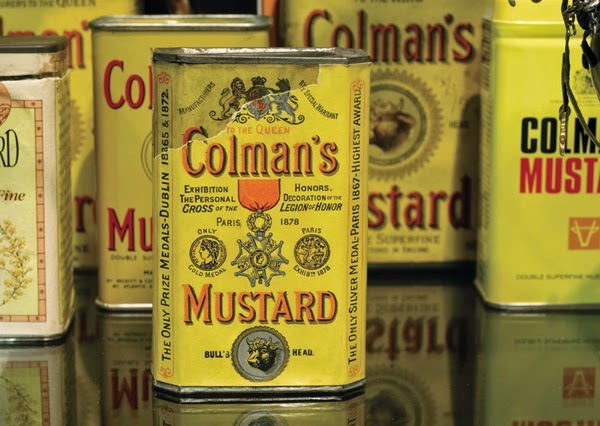 The mustards that we use on our meats and sandwiches developed from the dry form of mustard that was milled like flour from tiny mustard seeds. I am not a yellow mustard fan, but I do enjoy German coarse mustards and many of the flavored specialty mustards. Are you a mustard fan? The first FULL MOON of the New Year is tonight. It's called the Wolf Moon. This beautiful photo was found on Pinterest and I love it. I don't know if the clouds will clear enough here in Oregon for me to actually see the moon tonight. 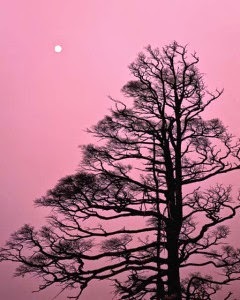 Some of the other names are winter, quiet, freezing, cold and staying inside moon. I am sad tonight. On Saturday, Jim and I were told that a dear friend had taken his life. His dad drove to our home to tell us. I taught with his mom as a young teacher and have known Tim since he was in grade school. He was struggling with things in his life but we thought he was doing better. It will always be a mystery, something we will not be able to understand. He leaves a daughter behind who he loved so dearly. I am praying for all of his family and especially his daughter. So very sad. I want to thank all my sweet blogger friends who have been so kind to read my blog and leave me messages. It is just hard to keep doing everyday things right now. I will be back soon. 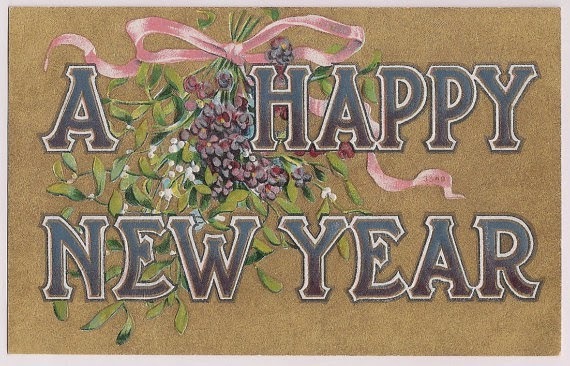 Happy New Year to all my blogger friends and family. I am going to be pretty limited posting until I get a new computer. I am long overdue for the upgrade on my laptop, so I guess that will be my first adventure of 2015. I am not going to make resolutions this year or overplan my hopes and dreams. I am just going to jump in and see where God takes me. It was a little different welcoming in the New Year last night. We had our little Otto here and he screamed his way through the first 15 minutes of the New Year. Poor baby...we think he is cutting teeth. Grandma and Grandpa need a nap. My poor laptop is on it's last leg. I haven't been posting much during the holidays as I can't load pictures from my camera onto my old laptop anymore...sigh. 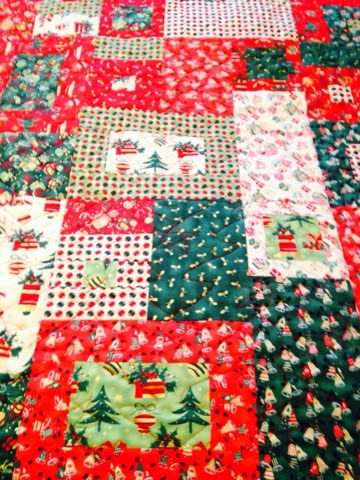 So I am going to try to post this as I want to share and record the history of these two Christmas quilts. 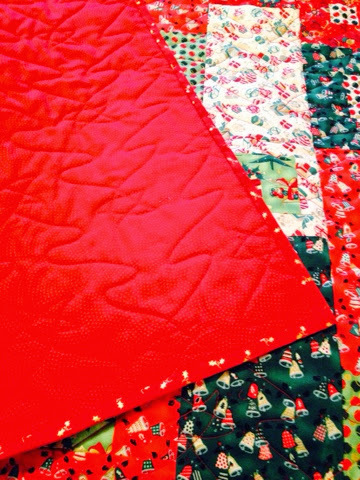 Last fall, I bought Christmas fabric for two quilts before I went to the Canby quilting retreat. 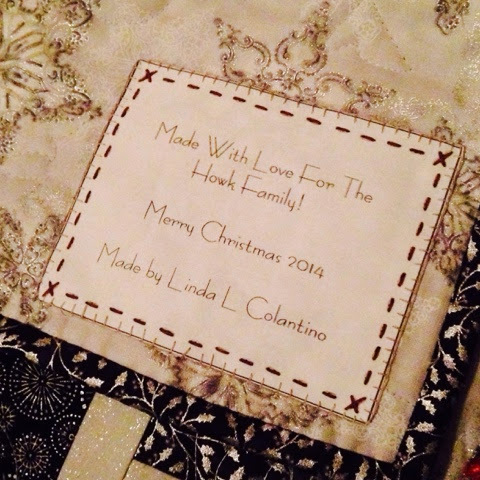 I wanted to make each of my daughters and families a quilt. 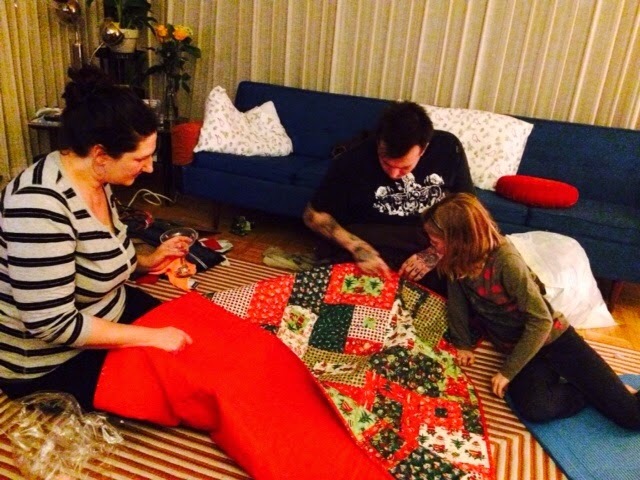 I have never made them quilts as they took so long to settle down, marry and have homes...lol! So this was the year to do it. Eric and Gina live in Seattle in a very mid century home. 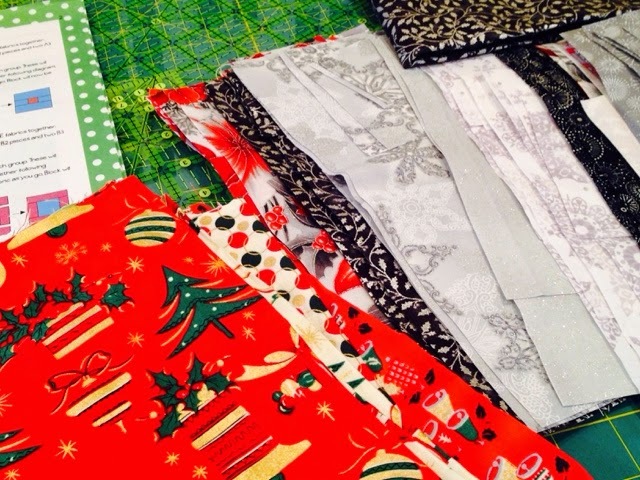 Their tree is white, so I chose the red, black, silver and white fabric for them. Chris and Angie live close to us and love the 50's and 60's look, so I chose the reds and greens with vintage colors and prints. Their family room is painted with the lime green that is in the quilt. 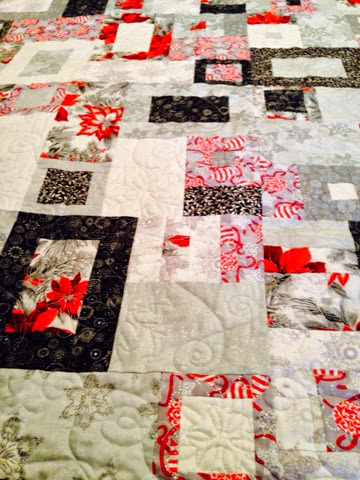 The pattern is called TOSS UP and was easy, but time consuming. 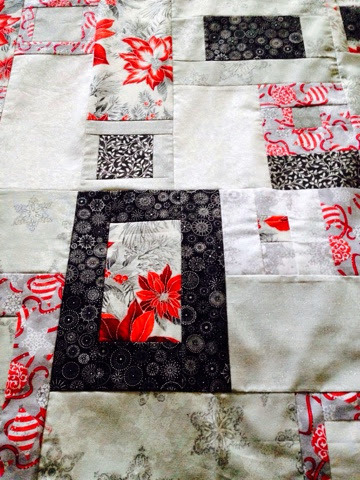 You end up with big blocks about 12 inch squares. 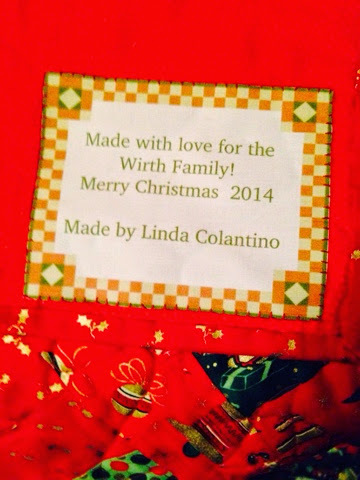 My good friend and wonderful long arm quilter did the quilting for me. 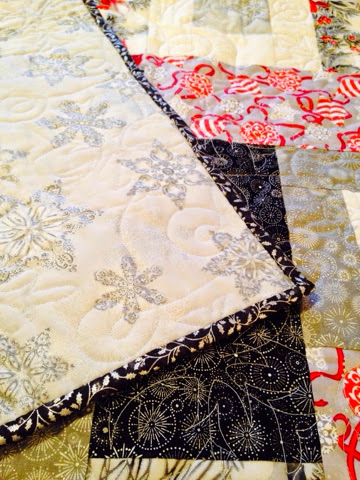 The silver one has snowflakes quilting in it and the red one is quilted with a whimsical tree pattern.Thank yo Nancy Pietzold for the excellent quilting job and for getting them done so quickly for me. I was so pleased with the final results and so pleased to give them to my girls. 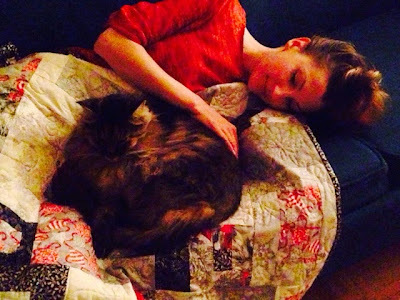 Of course, Tuba the cat liked the quilt too!